We could have gone to Nice last Bank Holiday weekend and taken in the climbs of the Alpes Maritimes, popped over to Monaco for some beautiful people spotting at the Formula One racing, or even zipped West to Cannes for some even more beautiful people spotting. Instead, we weighed things up and said naahh - we'll go to North Wales instead ! 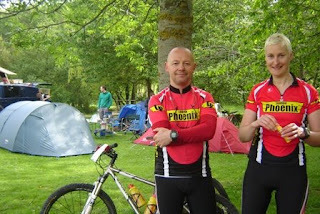 I'd always fancied doing a mountain bike event, but had never really tried one. This was mainly because my weak bike-handling skills, and a lack of a decent bike meant that I would risk frittering away my entry fee by not being able to last the duration. With the new format of the Merida Bikes weekend including a cyclosportive, I was quite appealed to the idea of giving it a go. I'd be able to manage at least half of the weekend activities so my trip would not be a complete waste of time. Accommodation was in the Ruthin Rugby Club field. Things were fairly quiet when we arrived on Friday early evening. 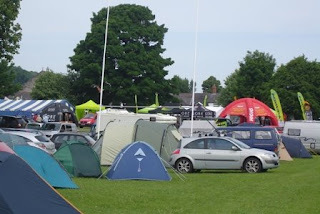 But by Saturday afternoon, and in the sunshine the place became quite busy and the field was awash with cars, vans, camping cars, and of course, tents. There was a real buzz in the atmosphere as lots of mountain biking buffs milled around. We bumped into a few people we knew from London. 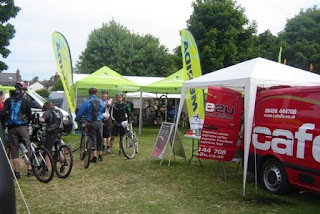 A few of the big mountain biking companies had stands set up to try out different bikes, and look at the latest gear etc. With the site equipped with a big refreshment tent, children's films showing, a bouncy castle, music playing, and a bar, there was something for all the family. And many families, with their very elaborate camping gear had clearly come to make a weekend of it. 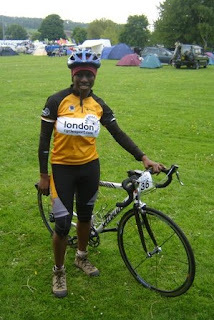 My Saturday was spent on the road doing the advertised 80-mile cyclosportive. The start time for this was between 8am and 10am. I had been aiming to get away by 9. However, not having factored in how much longer it takes to go to the toilets/get breakfast etc meant that I didn't get away until 6 minutes past 10. The organiser made a point of telling me he'd had to switch on the timing mat specially for me as I was 6 minutes late, and the main pack had left about an hour earlier ! I hadn't made a big deal about this event as for me it was just a chance to get in some miles around the North Wales hills. From the start list I'd seen that numbers were quite low by cyclosportive standards so I would end up on my own during the ride sooner or later, especially as start times were so widely varied. For that reason I wasn't that worried about setting off alone. Conversely, the organiser seemed quite anxious that I might get swallowed up somewhere in Snowdonia, never to be seen again. He made a point of checking I had the map, emergency telephone numbers and that I knew what colour arrows I should be following. I'm surprised he didn't check I had an appropriate survival bag ! So I headed out, first north to the market town of Denbigh and then south west past Llyn Brenig where there were lovely views of the lake. This was followed by pine trees through Clocaenog Forest and a very fast descent to Cerrigydrudion, before I wended my way through narrow twisty lanes to reach the outskirts of Bala. This was the furthest point of the ride, and it was good to know that I was now on the homeward run. I was enjoying riding through these calm surroundings on a sunny Saturday afternoon, but I was surprised that I hadn't seen any other riders at all - not even people doing the leisurely 40mile bike ride. There then followed my favourite part of the ride - the section from Corwen to Llangollen via the minor road that is parallel to the A5. This road constantly rises and falls, and twists and turns through the forest as it skirts the base of Llantysilio mountain. It's about 8 miles long and passes through Carrog and Rhewl. As you ride it you don't know when it will finish. You don't want it to finish. I didn't. It was a narrow road where very few cars passed by. (A recurring feature throughout the route.) 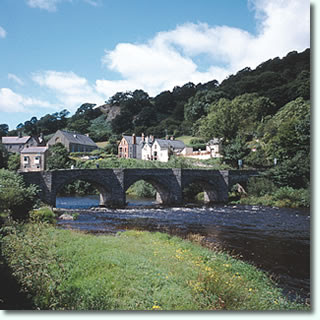 There was just natural beauty, horses, farms, the sound of the river Dee below, and the choo choo-ing of the Llangollen railway. It was along this road that I realised why the organiser had been so worried about me setting off late and on my own. The sight of the "feedstation" sign provided a welcome break, and a convenient place to stop for a snack. Unfortunately there was no sign of food at the feedstation. In fact there was nobody ! Had I really been riding that slowly ?? It must have been a strange sight seeing a lone rider with a race number on her bike standing outside a feedstation that had no sign of feeding ! A local lady came up and asked me sympathetically if I was ok for food and drink. As ever, I had my rucksack of supplies, so I just sat on the wall and ate a banana I had with me. I also realised at this point that I was nearer to home than I'd thought. According to the advertised 80-mile ride, I still had 25 miles left. In fact, the lady told me it was only 15 miles back to Ruthin. But then given that I had the Horseshoe Pass to deal with maybe the 15 miles would feel like 25 ! In fact, the Horseshoe Pass was not bad at all. As "infamous" passes go, I think this one is a real puppy ! The sign board claims the steepest point as being 20%. I'm not sure about that - my Garmin registered the steepest section as 13% - no worse than the streets where I live ! Admittedly if I tried to ride it at record holder, Chris Boardman's pace I might suffer a bit. The run in to Ruthin was very pleasant - again on another virtually car-less road through Graig-fechan. As I rounded the corner to storm through the finish line, the commentator shouted to everyone "give a big cheer to the last finisher, Frederica H"
How embarrassing was that - and what's with the Frederica ?? In all the disorganisation of mine and Fred's tents I'd picked up his timing chip instead of mine, when leaving ! Oops ! Well, at just over 5 hours for the 72-mile/1700m- climbing ride, I hope I didn't bring too much shame on his name. Fred was more concerned about where he could watch the Munster-Toulouse rugby final. So we went to a pub in Ruthin, watched the rugby match and then carbo-loaded for the following day's ride. Unlike the previous day where comparatively few people took part, this stage of the event was what it was all about. Everyone got involved - including Fred and our London Phoenix buddies. The ride started well enough. About 500 of us set off in the sunshine through the lanes around Ruthin. There was a good atmosphere as people looked forward to enjoying some rough stuff. Given that these events are not races there seems to be a much more relaxed feeling. Nothing intimidating or tense, like what you get in road races. There wasn't any mad fierce dash, like what you get in cyclosportives. It was just people riding along and chatting. The first few miles were on tarmac. Not easy though - we were very quickly met with a 15% gradient, which continued for 2 miles, and increased to 20% towards the end. Many people had to walk. Fred and I rode up together at a comfortable pace. The climbing I'd done the previous day had set me up nicely for more climbing so I felt fine. However, the trouble started for me once I was off road. The initial wide fire roads were fun - both on the climbs and on the descents. But after that there followed lots of single track sections. These were basically stony sheep trails around the side of the mountains. I had to walk along these parts. If only I'd been wearing trail shoes ! Although I hadn't fallen down, I lost confidence as lots of people around me seemed to manage the trails quite comfortably. Many people passed me. Some of these were people I'd passed earlier on the uphill sections. I didn't see them again until the end of the ride ! There was a choice of 4 routes - 30km, 50km, 75km and 100km. 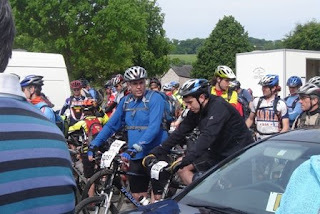 We had initially chosen to do the 75km route. Within a short time of leaving the tarmac I realised I'd only be good enough to do the 50km ride. After the first feed station, at the half way point it began to rain. I was spending more and more time walking, and it started to get a bit ridiculous. I was also getting cold as I just wasn't working very hard. Fred had a cold, and my pootling antics weren't helping matters for him. The rain became heavier, so we decided to just take the short cut back to Ruthin by road. At least that way I would get a work-out. In the end, we rode 60km, though 20km of that had been on the road. It's a shame we didn't get very far, but at least it was more challenging than anything we would've done in London. As I said earlier, my mountain biking skills are not that hot, and my bike even less so - as I was constantly reminded by our mtb-ing friends from London Phoenix CC. In David's words, "those forks are over !" 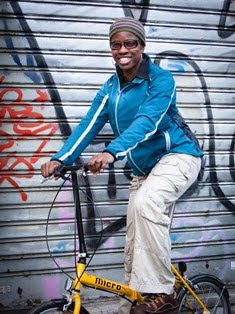 Ok - so it's a 1999 Specialized Rockhopper with orange reflectors on the wheel spokes, and it used to have a bell. I like it. There's a story behind it. How I managed to grab it 8 years ago in a closing down sale while on a trip to see a friend in Aachen, Germany. The ultimate impulse buy. Then I rode to the station with it and had to persuade the good people at Brussels train station to let me take it on the Eurostar with me and set me down at Ashford International and not Waterloo. It felt like a bit of an adventure at the time. I was just glad to have it home with me, in England. Over the years the bike has never let me down. It served me well in the 'cross races before I got a cyclo cross bike, and it was a good spare for me last year when I hurt my arm and couldn't use the 'cross bike. So yes, the Rockhopper is an old favourite of mine, but maybe for proper mountain biking I will need to look to get something else. That would surely make a difference to my confidence, and my riding. By the time we reached the tent the rain was falling heavily, and we had to get changed very quickly just to keep warm. We then spent the rest of the afternoon in the refreshment tent, eating hot stew and watching the rain. 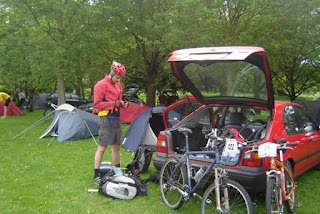 Once the heavy downpour turned to drizzle we then dismantled our tents, packed up the gear and drove back to London. A bit of wet end to the weekend, but all in all our rough weekend was quite enjoyable.